‘China: Between Clouds and Dreams‘ is the third of Phil’s trilogy of series on China spanning the past 25 years. Phil’s first film, broadcast in 1982, Korup: An African Rainforest spearheaded the campaign to establish the Korup National Park in Cameroon. A ten year campaign. 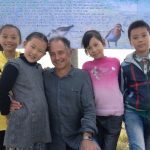 Korup led to Phil’s first natural history series for C4, ‘Fragile Earth’, before moving to ‘people’ with his double BAFTA winning ‘Baka: People of the Rainforest’ and subsequently to China with his two multi-award-winning series on China, Beyond the Clouds (1994) and Shanghai Vice (1999). Phil’s docs have won many prestigious awards including BAFTAS, EMMYS, PEABODYS, The Royal Television Society, Wildscreen and Grierson Awards. Phil directed the movie of Thomas Hardy’s ‘The Woodlanders’ which won Best Director and Best Film at the 1997 Shanghai Film Festival. Phil has lectured to many audiences around the World including BAFTA, The Royal Society of the Arts, Harvard and Oxford Universities. In 2014 Phil was awarded an MBE by the Queen for his ‘Services to Conservation in Africa and China’.